Speaker Nancy Pelosi boasted that a $15 minimum wage would pass “in the first 100 hours” of a new Democratic-controlled Congress. It might be good politics, but is a $15 minimum wage good economics? 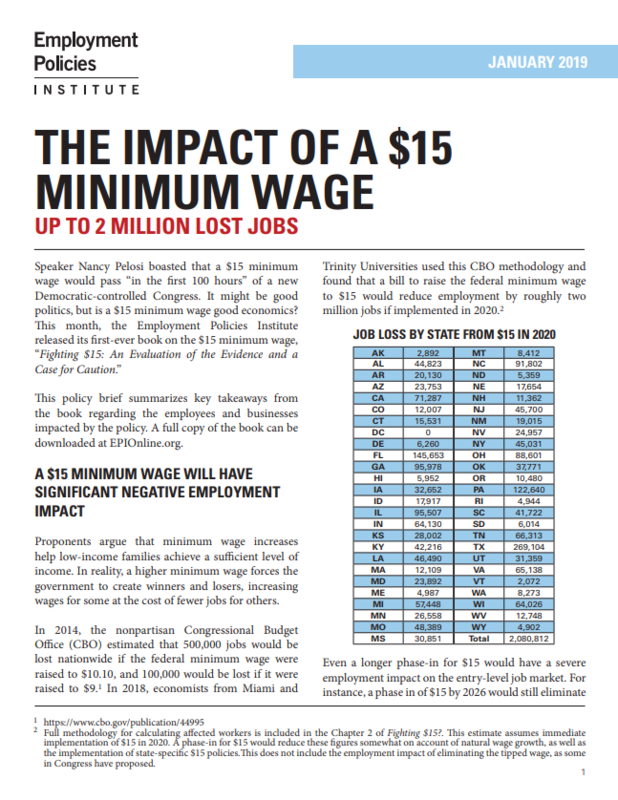 This month, the Employment Policies Institute released its first-ever book on the $15 minimum wage, “Fighting $15: An Evaluation of the Evidence and a Case for Caution.” This policy brief summarizes key takeaways from the book regarding the employees and businesses impacted by the policy. A full copy of the book can be downloaded at EPIOnline.org. In 2014, the nonpartisan Congressional Budget Office (CBO) estimated that 500,000 jobs would be lost nationwide if the federal minimum wage were raised to $10.10, and 100,000 would be lost if it were raised to $9.00. In 2018, economists from Miami and Trinity Universities used this CBO methodology and found that a bill to raise the federal minimum wage to $15 would reduce employment by roughly two million jobs if implemented in 2020. Click here to see the job loss a $15 minimum wage would cause in your state.